Provisional Selection List-3 for Supernumerary quota seats Counseling Date: 04-Sep-2017.Merit, Selection List ,call letters download 2017 Wait List for vacancies, Provisional Selection List for CAP, NCC, PH quota seats, Nuzvid, Idupulapaya, Ongole, Srikakulam admissions List @admissions.rguktn.ac.in Provisional Selection List for Supernumerary Seats . AP RGUKTs IIIT Selection List, Counselling dates for B.Tech admission s in 4 Campuses. AP RGUKTs IIIT Selection List for B.Tech admission in Nuzvid, Idupulapaya, Ongole, Srikakulam campuses. AP RGUKTs IIIT Certificate verification Dates for Counselling for BTech admission s in 4 Campuses. 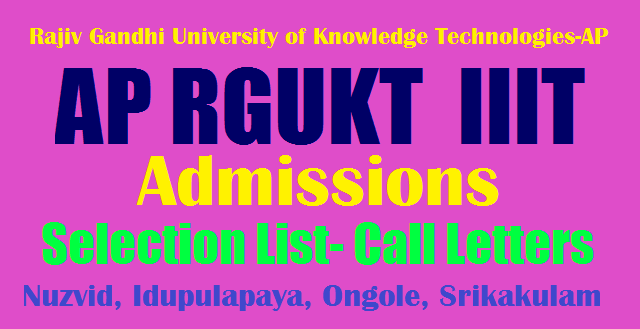 RGUKT Nuzvid, Idupulapaya, Ongole, Srikakulam IIIT Results, Selection List for BTech Degree admissions 2017, RGUKT AP IIIT Results, AP IIIT Selection List, IIIT Shortlisted list, Counselling dates for BTech Degree admissions 2017: Rgukt officials have been published IIIT nuzvid admissions 2017 , AP Rgukt notifications for admission in to 6 years B.Tech programme for the academic year 2017- 2018 . So candidates who want to apply to IIIT nuzvid admissions 2017 need to download detailed AP Rgukt notifications prospectus through official web portal admissions.rguktn.ac.in/ugadmissions 2017 IIIT nuzvid admissions 2017 AP Rgukt notifications. The idea to create IIITs in Andhra Pradesh came in April 2007, at the request of the Chief Minister of Andhra Pradesh. He was dissatisfied with the opportunities available to the rural youth and wanted to set up at least three IIITs in the three regions of Andhra Pradesh which would ensure better opportunities for rural students. AP RGUKTs IIIT 2nd PHASE Selection List/ Results Nuzvid, Idupulapaya, Ongole, Srikakulam admissions Counselling 2017 :IIIT nuzvid admissions 2017 to the first year of 6-year integrated engineering course in the Rgukt University will be granted only after satisfactory verification and scrutiny of the details mentioned in the application and the original certificates / documents submitted by the candidate at the Certificate verification and Admission centre. Mere selection for certificate verification /documents will not guarantee admission to the candidate. Provisional Selection List for Sports quota seats announced Counselling will be on 23-Aug-2017. The following have been provisionally shortlisted for admissions under Supernumerary Seats. If a candidate will not turn up, the next candidate from the same mandal will be called for. Counseling will be on 17-Jul-2017. Phase-II Certificate Verification & Admissions. a) Admissions to the first year of Integrated B.Tech Program (2017-18) will be based on merit in the Grade Point Average (GPA) and Grade obtained in each subject and by following the statutory reservations of the State. A deprivation score of 0.4 prescribed by the Government for the year 2017-18 under Statute 13 (3), shall be added to the 10thclass GPA of those applicants who studied in non-residential Government Schools including the Zillaparishad, Municipal, Kendriya Vidyalaya, AP Model Schools and Kasturba Gandhi Balika Vidyalaya Schools, with an objective of providing weightage to the socio economically challenged students in the admission process. b) Special allocation one seat to each unrepresented mandal prescribed by the Government for the year 2017-18 will be made, which shall be filled up by following the rule of reservation, pending amendment to Statute-13 of RGUKT Act,2008. c) Admission to 85% of total available seats shall be reserved to the concerned local University, where the Institute is located and the remaining 15% of the seats shall be un-reserved and are open to all applicants of both Andhra Pradesh and Telangana, as specified in the Presidential Order 371 Article D in consonance to Section 95 of the A.P. Reorganization Act, 2014.
a) Candidates should have passed SSC (10th class) or any other equivalent examination recognized by the Governments of Andhra Pradesh &Telangana State, and conducted in 2017.
b) Candidates should not have completed 18 years of age as on 31.12.2017, (21 years in case of students belonging to SC and ST categories). Citizen of India (OCI) Card Holders. a) The candidates should apply through APOnline services only. c) The application fee should be paid in cash at APOnline service center, for which the center will issue a receipt. d) An additional amount of Rs. 25.00 per application should be paid as service charges to the AP Online Centre. e) If any candidate applies more than once, then the latest application will be considered for the selection process.